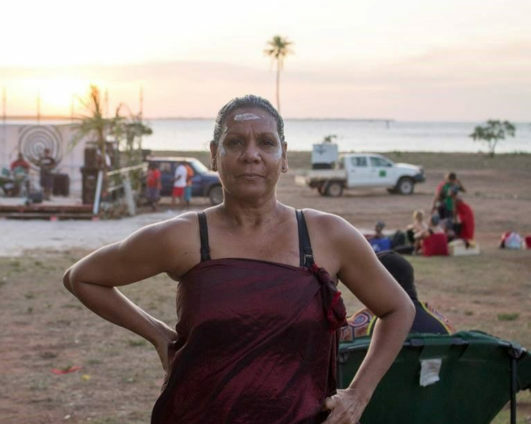 Fiona Wirrer-George Oochunyung is a freelance performer, cultural educator, writer and choreographer descending from the Mbaiwum/Trotj, Alngith/Lininigithi Wikway and Wik Apalich Nations of Western Cape York. Currently in her second year of PhD studies she is also a casual on-line lecturer. Author of five publications and three stage plays her works have been showcased both nationally and internationally. In 2004 Fiona won the National David Unaipon Award for unpublished authors for her biography Whispers of this Wik Woman. In 2006 the play adaptation made its debut at the Judith Wright Centre for Performing Arts. Fiona was both playwright and actor among a cast of five. Fiona has been choreographer for the Cairns Indigenous Art Fair since 2015 with her most recent work as choreographer being the 2018 Gold Coast Commonwealth Games Indigenous Fashion Performance. She is the recipient of the prestigious JCU Indigenous Research Training Program Stipend (RTPSI).